Bloom: Continual bloomer. 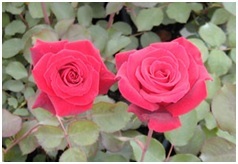 Produces scores of wonderful large, rich, dark velvety-red, double, cupped 4″blooms with 40+ petals. Interesting Facts: One of the finest of the red climbers. Dark green, glossy, leathery foliage. Striking planted against a white fence. Makes a good cut flower.